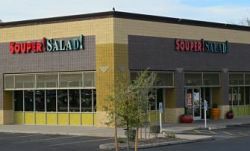 Great opportunity to buy an established Souper Salad franchise in Phoenix, Arizona (Arcadia neighborhood) near Sky Harbor Airport, and a bustling business community. Anchor stores for the center include Fry’s Grocery, Target, and COSTCO. Significant intersection is 44th and Thomas (having considerable traffic flow throughout the day). 44th is also a major freeway exit. This Franchise has been established at this location for 20 years. No local competitor offers buffet and fresh, healthy choices. Owner is selling as they have another franchise in Mesa, Arizona and wish to concentrate their efforts on one store. This is an ideal business opportunity for a motivated new owner to take advantage of the existing business and grow it to its full potential. Souper Salad is one of the largest soup and salad restaurant brands in the Southwest. While serving over 8 million customers a year, this isn’t an average restaurant chain. Salads, handcrafted soups and fresh baked breads are prepared from scratch daily. Souper Salad is a one-of-a-kind restaurant, a progressive yet comfortable destination for customers who want more than assembly line products and services. It’s been our focus and commitment since the day we first opened our doors in 1978. Souper Salad is a privately held company, headquartered in Dallas, Texas, and operates 36 locations in 6 states. In the age of junk food and obesity, the Souper Salad alternative is a breath of fresh air for those who seek freshness, variety, and value. The menu is 100% trans-fat free – nothing is fried. Almost every diet-sensitive need is catered for in a comfortable dining experience, with a true commitment to today’s hectic lifestyle and pocketbook needs. “We have long been advocates for healthy fare. Souper Salad was our favorite quick-serve spot when we were completing our degrees at Arizona State University. The Souper Salad was just down the street from us, offered fresh, healthy options, and was priced right because money was tight. 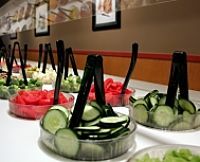 Souper Salad wasn't a known concept in the Boise area, so the menu surprised first-time customers; our biggest satisfaction has come from customer referrals and a very loyal customer base. 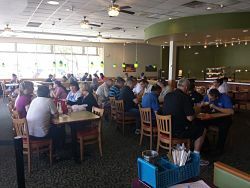 We have retirees and business people who stop in for lunch and a lot of families on weeknights and weekends. We had never worked in a restaurant, but we were given the tools and professional support from Souper Salad that have helped us become successful. We have also been open to suggestions and implemented changes to improve our daily operations." Brian and Krista Cromar – Boise, Idaho, Franchisees. To find out more about this Souper Salad restaurant please fill out the form below and submit.